NSA@home is a fast FPGA-based SHA-1 and MD5 bruteforce cracker. It is capable of searching the full 8-character keyspace (from a 64-character set) in about a day in the current configuration for 800 hashes concurrently, using about 240W of power. This performance is equivalent to over 1500 Athlon FX-60 CPUs, which would take about 250kW. Here's an archive of my appearance on FOX News this morning. It's such a surreal experience, being interviewed remotely on live TV. The show was broadcast from New York, but I was in St. Louis. They'd rented out a local PBS studio in downtown St. Louis, to do the live feed. I was a "talking head." So there I am in the St. Louis studio, at 6:45 a.m. on a Sunday morning, trying to look perky even though I'd been up since 3:30 a.m. to get ready. There were two technicians in the studio, wearing headsets and outside of my vision. So I'm perched on a stool, looking into a blank camera, listening to the audio feed via an earplug. I had no visual feedback whatsoever as to whether or not I was on the air -- no red light, no monitor. For a sense of what this feels like, go sit in front a blank wall, stare at it, and try to keep your face smiling and engaged, even though you have no idea of whether or not you're even being looked at. Elonka just appeared on Fox and Friends. Someone should post the video she archived up to Google Video so we can embed it..
All entries will be judged by a panel of elite IMI personnel at an upcoming conference. Reply to this post with your entries. Be prepared to back up your joke with examples, proofs, and academic papers. I got word from one of the producers that my website will be mentioned on this show, sometime in February. I don't have an exact date yet, but will post here when I find out. As a heads-up, "Saturday Night Solution" isn't really a "show" so much, as a theme on Saturdays. Or in other words, you can't specifically TiVo it. ;) The way it seems to work, is that there are two hosts throughout the evening, who chatter during commercial breaks and offer other tidbits of information about private detectives or spy equipment or, in this case, on secret codes. I don't know exactly in which break that they'll be talking about Kryptos, but my best guess is that it will be in the break between the two shows "Forensic Files" and "Body of Evidence" on Saturday evening. 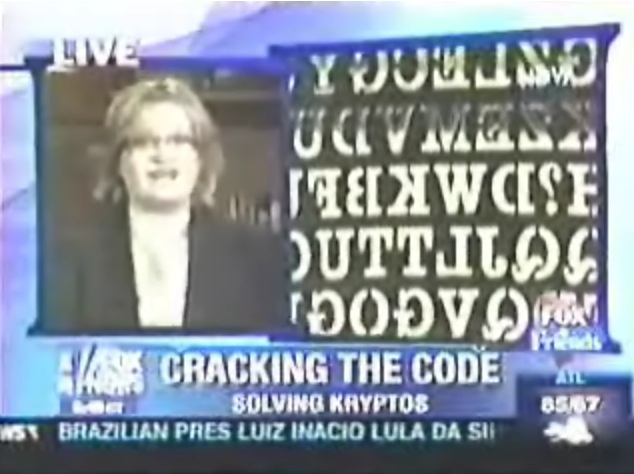 There will also be a longer segment on Kryptos coming up this summer, on the PBS program "Nova." (Specifically, NovaScienceNow) I'll post more info on the exact date, as soon as I hear anything. And for anyone who misses the CourtTV segment, I'll have a mirror up on my personal site later, probably at http://www.elonka.com/elonkanews.html . Hezbollah guerrillas were able to hack into Israeli radio communications during last month's battles in south Lebanon, an intelligence breakthrough that helped them thwart Israeli tank assaults, according to Hezbollah and Lebanese officials. MemeStreamer Elonka has been all over the media lately, as she has become a leading expert on all things related to code breaking. Radio and TV talk shows, news articles, et cetera. Needless to say, we are all very proud of her, and really enjoying watching her get all this attention. I suggest checking out her page here on MemeStreams for links to and information about all her recent appearances. Also, many of us have come to the conclusion that it is necessary to get Elonka on the Oprah Winfrey Show. It just fits. It must happen. Elonka would fit perfectly on that show. You can help this out by suggesting they have her as a guest using their web page. Well, this is interesting. Talk about a troll... The line caught me. So, who do you trust? Why? How likely are they to screw you over? How likely are they to screw up? Vapor? How do you inhale outside San Francisco? So, tell me about the spirit of our times... I have a few ideas of my own, just no resources. Although the novel consists of only 14 Chinese punctuations, he insisted that it tells a touching love story, with ups and downs and a complete outline, which he spent a whole year on the novel. Hu is offering to reward those who can understand the hidden story with 140,000 yuan. He said 20 people have already come with their interpretations but none of them satisfied Hu. Hu thought they are all too far away from the story his novel is telling. "I have my own answer, which is around 100 Chinese characters. The interpretation should cover the description of characters and the plot of the story, I will reward someone who can guess 80 percent the hidden story correct" he said. Fun 90-minute episode this week. Main topics: Privacy, Identity Theft, and Kryptos.